If you own Motorola Moto Z Force, please do leave your feedback too. The Motorola Moto Z Force is the successor to the Moto X Force that we saw last year. The phone brings the same ‘Shatterproof’ display that we saw on the Moto X Force and is pretty much the contender for being the tough flagship of the year, given that the Samsung Galaxy S7 Active may not be a global roll out. Purely in terms of the specifications and behavior, the Motorola Moto Z Force is very close the Motorola Moto Z and brings the same modularity features.. The Motorola Moto Z Force comes with a 5.5 inch Quad HD display with a ‘ShatterShield’ technology. Motorola promises that even under extreme stress the display would not give in and if it does, Motorola will replace it as long as the phone is within the warranty phase of the glass. The 5.5 inch display features an AMOLED panel so the colors are bright and punchy. 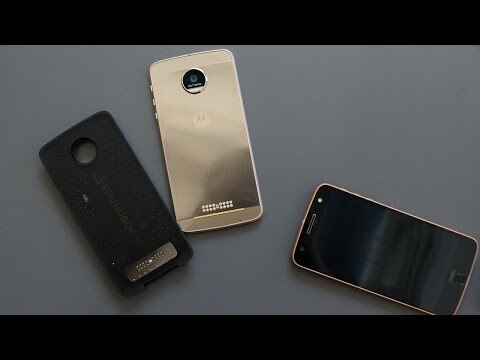 The design of the Moto Z Force is very similar to the Moto Z. The body here, is made up of ‘Aircraft-grade Aluminum’, which adds a bit of weight to the device making it 136 grams on the weighing scale. The phone has subtle curves on the sides and overall a flat back with a camera module that sticks out. As far as the internals go, the Motorola Moto Z Force comes with the same 2.2GHz Snapdragon 820 chipset as the Moto Z. You get the same 4GB LPDDR4 RAM as well as the option of adding on the Moto Mods to the 12 pin connector at the back to enhance the functionality of the device. There is a fingerprint scanner on the front of the device for secure unlocking. On the software side, typical in Motorola style, you get close to a stock Android experience with Android 6.0.1 running. The Moto Z Force also comes with a nano-coating for water repelling, making your phone resist occasional splashes of water. The camera on the Motorola Moto Z Force is a 21MP snapper with f/1.8 aperture. There is OIS, Laser Autofocus as well as a dual tone flash to help you take shots faster in challenging situation. The front facing camera is a 5MP sensor with a wide lens, which would be perfect for you take the selfies that you inevitably would, with the device. In order to store all these pictures and media content, Motorola gives you an option of picking the Motorola Moto Z Force in either 32GB or 64GB variants. There is an additional slot for expansion via Micro SD card on the phone too. Other than the camera, an area where the Motorola Moto Z Force trumps the Moto Z is the battery life. The phone features a non-removable 3600 mAh battery, which puts the phone in frame for smartphones with big battery life. On top of this, you always have the option of adding the jacket of a new module in order to increase the battery backup. Just like the Moto Z, the Z Force also ditches the 3.5mm headphone jack in favor of a single USB Type-C, though it does bundle an adapter with the phone. You have LTE, Wi-Fi, Bluetooth and GPS on board here as far as other connectivity options go. The most obvious competition for the Motorola Moto Z Force comes from its predecessor, Moto X Force. There is the Galaxy S7 Active, which falls away because of limited roll out. If having a phone that features an indestructible display is not a priority and you do not have butter-hands, you could look at the Motorola Moto Z or even the LG G5 as viable alternatives.